Detractors may argue that the whole ‘sport SUV’ concept is incongruent enough to lack even a sensible name. Does such a description infer ‘sport-sport utility vehicle’? Or perhaps ‘double-sport utility vehicle’? How about, as some might suggest, just plain ‘silly’? Still, many buyers are drawn to part with good cash for plus-sized family-friendly vehicles with a definite skew towards driving enjoyment, flagship variants described in marketing material as ‘sporty’ and ‘dynamic’ so frequently you’d presume the spin doctors get paid by each word. Conceptually, there’s ample appeal, be it in the motoring duality of combining fun and practicality for the single-car garage space on High Street, or as an antidote against Soccer Mum stigma. And a good dose of sportiness and a kick of dynamism will do, even if the overall package mightn’t pack the outright heat of what might be considered a proper ‘high-performance SUV’. Add some parameters – a circa-$100K budget, some Euro badge snobbery – and you arrive at the mid-sized, luxo-dipped, petrol-powered ‘sport SUV’ range-toppers from Audi and Jaguar in the SQ5 and F-Pace S 35t, both of which having been recently updated. 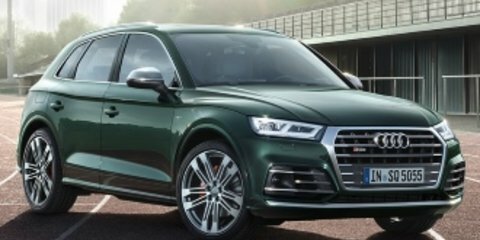 At $99,611 list, the SQ5 landed in Oz midyear to sit atop the all-new, second-generation Q5 range that arrived a couple of months earlier. And the headline news was that the range-topper had ditched its superb ‘high-power’ 3.0-litre bi-turbo six diesel – 230kW/650Nm in regular form, 250kW/700Nm in Plus guise – for turbocharged petrol motivation in this new version. While today’s SQ5 TFSI has the same cylinder count and engine capacity as the old TDI, the shift to petrol sees more power (260kW) and less torque (500Nm) on the form guide. For the record, the petrol SQ5 is, at 5.4 seconds for the 0–100km/h sprint, three-tenths slower than the old more-affordable ‘regular’ SQ5 ($92,600) and the pricier SQ5 Plus ($108,900) versions, both of which featured different tunes of the rather excellent ‘high-power’ diesel-powered 3.0-litre bi-turbo V6. This new petrol version has scored an eight out of 10 rating at launch. The F-Pace S 35t, at $104,827 list, isn’t merely five-grand pricier than the Audi, it’s also a formidable $12,620 pricier than the second-from-top Portfolio petrol AWD variant. And, thus, it’s the most expensive F-Pace out of a dizzying 18 different variations offering the choice of petrol and diesel fours and sixes, rear- and all-wheel drive, combinations of which can be had in Portfolio, R-Sport or Prestige trim levels. For the record, you can have your S as a diesel for $101,795 list. We’ve not driven this brand-spanking MY18 F-Pace thus far, its update focusing on Ingenium engines in lower variants, a dual-view infotainment system and a nip and tuck to the interior. The ‘S’ is the only version available with the 3.0-litre supercharged petrol V6 boasting 280kW and 450Nm, so 20kW up if 50Nm down on the Audi. Its 5.5sec 0–100km/h sprint claim is a scant one-tenth slower than its German rival here. Our Audi test car jumps from $99,611 to $114,237 before on-roads thanks to the addition of a Technik package ($5600) adding LED Matrix headlights, LED tail-lights and dynamic indicators, B&O surround sound and head-up display, a quattro sport differential ($2950), and spruce-ups such as a Titanium Black appearance pack ($1430), carbon-type mirror caps ($1300) and interior inlays ($1500), a ‘black pack’ ($1650) and black metallic paintwork ($1846). There’s a further charge for the smart key with keyless entry ($1890), blind-spot monitoring and reverse traffic detection ($1180), which is separate from the lane-keep assist system ($1120) and the adaptive cruise control ($3370). And while you wager that adding the Connect Pro pack ($1790) and Adaptive Surface Response smarts ($310) should just about have every conceivable extra covered, pry another $120 out of your back pocket for rear-seat remote release levers. Yes, really. Grand total: $149,717 before on-roads. Or nearly a 50 per cent hike in price just in options alone. Whether you compare how many of the Jaguar’s options – smart key, blind-spot monitoring, digital dash – are standard on the Audi, or itemising just how much stuff you don’t get with F-Pace’s highest of four ‘S’ trim levels, the value pitch appears, frankly, preposterous. Let’s pull few punches. This pricey leaping cat will have to pole-vault the hurdle called ‘value’ to beat out its Audi rival to a win here with an impressive – dare we say dominant – display as measured by ‘Sport SUV’ goodness. Both SUVs ply 3.0-litre force-induced goodness via eight-speed automatic transmissions and all-wheel drive. The Jag does claw back a little in the value stakes with its chassis smarts – torque vectoring is a standard function on the F-Pace S, whereas you’ll need to splurge nearly three-grand extra to add it to the SQ5 via that optional ‘quattro sport’ differential. Each car offers selectable drive modes covering off Dynamic, Normal and Eco suites to adjust throttle, transmission, steering and handling calibrations, as well as user-selectable individual modes. There’s also a dedicated ‘sport’ selection for each car’s transmission. Only the Audi, though, gets a ‘loud’ exhaust mode accessible via mode fiddling or a dedicated button on the console. Fire them up and it’s the Audi that has the brassier, meatier soundtrack that’s present in milder drive modes, near raucous with the exhaust’s ‘loudness’ activated. There’s a real rumble to it: not quite V8-like, yet not much like most V6s either. The Jag, however, has a smoother, quieter, more polite tune that’s not nearly as characterful as the Audi, particularly from inside the cabin. Nor does it really amp the vibes up much, either, once you engage Dynamic. Neither SUV makes changing and tweaking driving character easy on the fly, each requiring button pushing and sequential scrolling through modes, and submenu digging for finer tuning. At the least, the Audi’s tap-for-Sport transmission controller is slicker and quicker to activate than the Jag’s rotary-type transmission selector, though it still does the marque’s signature party trick of dropping flush into the centre console at shutdown only to glide back into service, in a robotic manner, on start-up. Mid-five-second acceleration times isn’t hanging about, and it’s easy to presume the Audi’s one-tenth advantage lies, in part, in a more lightweight form. And yet the SQ5 clocks in at 1945kg against the F-Pace S at 1861kg unoptioned, though by the seat of the pants, you swear the Jag is the heavier of the two. Or perhaps much of the differences felt have more to do with their respective choices of powerplant. The F-Pace’s throttle response is a little more immediate, a typical trait of its supercharged format, while the single turbocharger located in the SQ5 V6’s valley is a little more elastic and less direct off the mark and at low speed, at least in Normal mode. In Dynamic, the Audi is noticeably sharper on initial take-up and as all 500Nm arrive at just 1370rpm, just off idle, it feels to launch harder out of the hole, grabbing the German SUV’s scruff and throwing it at the horizon with more gusto and vigour. With patently less tractive effort in the low rpm, the Jaguar is less hasty to get a move on and its lower 450Nm peak shove doesn’t arrive until 4500rpm, which so happens to be the rev point where the Audi’s torque starts to drop off. The F-Pace compensates a little with rather urgent throttle response – it gives the engine’s all in the few centimetres of throttle travel – which provides short-lived satisfaction as it leaves the engine’s mid-range, once you dig in further, feeling a little lacklustre. Add the bolder-if-slightly-artificial sonics to the Audi’s low-end gutsiness and more linear and controllable engine character, and the steed from Ingolstadt is simply noticeably more satisfying on the march. And regardless of what the stopwatch says. That’s not to say that they can’t be downright fun to punt with vigour nor emphatically sporting-like in nature. That the Jag feels a half-segment larger than the Audi and quiet wieldy on the road doesn’t help its campaign. Nor does its relatively leaden steering. Both SUVs get adaptive steering smarts, but it’s the F-Pace that’s heavier around town where excessive steering weight makes for a chore, and doesn’t load up with resistance or deliver as much communication as the Audi does when pushed through a corner. The SQ5 is no pillar of steering greatness, but across the balance of driving it’s friendlier and imparts a more genuine sense of connection with the road surface. Not that the F-Pace can’t point and track through a corner with aplomb. Indeed, the sheer footprint of those massive 265mm-wide tyres generates impressive road-holding ability, particularly on smooth hotmix. Throw in mid-corner lumps and bumps and the Jag’s suspension and myriad handling smarts work hard to handle the sheer mass of those optional 22-inch wheels. The big cat errs towards a flat and neutral cornering stance, leveraging that grip for safe, predictable if not overly engaging passage. It errs towards generating pace rather than playfulness, but can certainly muster up a head of steam point to point across a twisty road. That said, the Jag’s suspension is very effective, if deceptively so: instead of offering a conspicuously softer and firmer setting the driver can turn on or off, it constantly varies damping, tempering the ride, controlling the bumps and harnessing grip in unison in quite a transparent manner. The Audi has similar continuously variable suspension smarts, but does feel to flex its chassis muscle more so when shuffling through drive modes. The character change is more conspicuous. It feels a bit livelier, a touch smaller, and despite having lower-slung seating than the Jag is easier to more accurately place on the road where you want it. The SQ5’s smaller (if hardly small) standard issue 21-inch wheels have slightly narrower 255mm rubber, though Ingolstadt’s handling package works the rubber its given impressively well. Play around with the steering and throttle through a corner and the Audi is more adjustable, if merely because it seems to transfer weight to the tyre where and when it’s needed most. Playful? Sort of. Engaging and co-operative? Reasonably. The SQ5 is better sorted as a corner carver than its underachieving RSQ3 stablemate, but not quite in league, you sense, with the best of Porsche’s Macan breed. Of course, the inevitable counter to all of this is the charge that an SUV has no place being wrung ragged on a backroad, let alone on a racetrack, and that owners don’t nor won’t punt them like they’re sports cars. But when buyers are asked to fork out extra for sport differentials (Audi) or boast digital lap-timers and g-force meters (Jag), they’d better walk the walk. Rounding out the dynamic packages are the brakes. Of the two, the Audi fits larger anchors, but while the hardware does add some confidence during extended punts, the consistency and pedal feel aren’t really much different between the pair. Both SUVs are quite pleasant when tooling around the ’burbs hauling loved ones, where perhaps the Jag hides its sporty stripes a little better. Audi seems to constantly wear its go-faster vibe on its sleeves, though it does demonstrate more shine in its around-town polish in its behaviour. Each is susceptible to thudding across expansion joints as nearly all large, low-profile wheel and tyre combinations do, though the Jag is sharper and the hits penetrate the cabin more conspicuously. Add the heavier steering and those trips across town for the Ikea run are a bit more of a chore. Either SUV suppresses tyre roar impressively well, isolates its cabin from ambient noise with aplomb, and perhaps bar the ever-present rumble from the Audi’s engine – albeit only under acceleration – they’re both quiet and polite when need be. Neither should the kids awake in the back during those long weekend away trips. Neither, though, are fuel misers. It takes gentle right foot and a lot of highway kays to get close to their claimed combined bests – Audi at 8.7L/100km, the Jag at 8.9L – and around town, even outside of peak traffic times, both regularly return sobering 12–13L/100km figures. The old diesel SQ5 was never that thirsty. If there’s a real annoyance with the SQ5 it’s the sailing mode that idles the engine at cruise. It works fine at doing its fuel-saving business on flat ground, but on downhill runs the SQ5 will sometimes add up to 10km/h of road speed, while at other times it’ll engine brake. Riding the brakes to save licence points and fines is, frankly, a pain in the arse. The larger perception of size with the Jag demands the driver to be a little more circumspect in tight parking spaces, though each gets handy 360-degree camera systems, parking sensors and active assistance. As mentioned, though, it’s only the F-Pace that commands a premium ($3630) for it. Ditto the ($3370) adaptive cruise, also standard on the Audi. The Jag’s stylised if reasonably unfussy cabin space looks very appealing, and you’re greeted by nice form-hugging sports seats trimmed in a combination of grained leather and ‘suedecloth’, the latter used to upmarket effect across the headlining and window pillars. It’s a little cosier for ambient space than the Audi, too, with a lower headlining and thicker, more vision obscuring A-pillars. The driving position is excellent, though the seat bolstering is quite firm. That suits the front row quite well, but leaves the second-row seating, with its unshapely contour, feeling a bit uncomfortable, particularly for adults during the long haul. There’s a mixed bag of materials inside the F-Pace – nice and convincing in quality in some areas such as the steering wheel, but there are perhaps more hard plastics than should be fitting this price point or its flagship variant status. The stylised design, with very neat mood lighting, does bring with it upmarket joy but it’s let down in the details, such as goofy button placement: it’s too easy to inadvertently nudge the memory switches to throw your seat out of whack, and those top-sill mounted window switches seem really misplaced. The Audi isn’t as stylised yet general cabin presentation is fancier, unsurprisingly more Germanic and pushes the ‘techy’ design barrow harder. Whether it’s the ‘square’-themed steering wheel, the choice of material combination or the diamond quilt stitched, full-leather bucket seats, it yells ‘sport’ and driving purpose a little louder, for better or worse. That said, there’s also a higher-class ambience than inside the Jag. The seats themselves are superb, with good seating position and more pliant ‘give’ in the padding than its rival for nicer long-haul comfort. Another SQ5 strong suit is the natural driver ergonomics, while switchgear, controls and material choices are a little slicker than the Jag, imparting a sense of higher quality. Whether or not Audi’s techier and busier approach to the driver display and infotainment screen design is more appealing than Jaguar’s simpler approach is down to buyer preference. That said, the German hardware is more comprehensive and quicker in performance and the software is both more fulsome and more intuitive to use. The F-Pace’s touchscreen-only infotainment is more distracting to use and lacks a handy console controller interface as fitted to the SQ5, is slow in response, the graphics look cheap and the navigation and radio screens are initially quite confusing. While the Audi’s all-singing and dancing approach might seem gimmicky at first, the touchpad with audible character confirmation is very handy for imputing sat-nav addresses without diverting your eyes from the road. The dual navigation screens, while mostly useless around town, are handy for route improvisation in unfamiliar territory by keeping the driver’s map zoomed and leaving the infotainment screen in a broad view. Neither car offers quick and easy drive-mode access. You can switch between modes swiftly enough in the F-Pace, but the Dynamic personalisation screen is very fiddly. The SQ5, for its part, demands laborious shuffling through modes sequentially to arrive at the right one. With its short rear doors, climbing into and out of the Jag’s second row is more cumbersome than doing the same in the Audi. Both SUVs are comparable for rear passenger roominess – two adults or three younger kids – until you position the SQ5’s standard-fit slide adjustment to its rearmost position. Seating thus set, the Audi offers superior rear leg room, though it does impact boot space by reducing it from 610 litres to 550 litres, neither of which can top the Jaguar’s 650L luggage space… If you don’t opt for a spacesaver spare wheel. With spacesavers fitted under their floors, the Jag loses on usable luggage volume with just 508L. 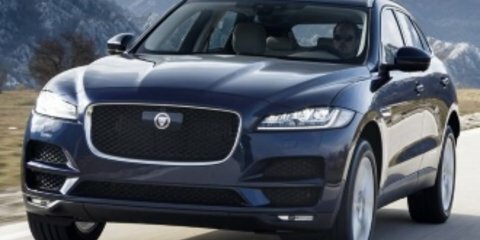 Each competitor offers 40:20:40 splitfold flexibility and remote latches in the cargo area, though the Jag’s are cost optional ($120). The SQ5 is the only one of the pair with a handy elasticised net in the floor to keep your payload such as groceries secure. Both SUVs are covered by a fairly rudimentary three-year warranty, though the Audi comes with superior unlimited-kilometre surety against the Jaguar’s 100,000km cap. Complimentary roadside assistance is offered on both vehicles for warranty duration. The Audi has a slightly pricier capped price of $1870 for three years/45,000km, or yearly/15,000km intervals. Meanwhile, the Jaguar’s $1800 covers a more fulsome five years/130,000km capped-price program. Did the F-Pace counteract its huge, ‘as-tested’ value handicap with dominant displays in all-round Sport SUV goodness? No it didn’t. In fact, pricing notwithstanding across the balance of the above criteria, the SQ5 proved the fitter device meant to represent solid family-friendly foundations forced through ‘sport’ and ‘dynamic’ filtration. This new TFSI version does ride, handle and steer better than older examples of its breed, and is certainly the more engaging sporting/dynamic experience in the company of the Top Cat from Jaguar. That it also piles on the feelgood character heavier and offers superior comfort and convenience levels, all at a friendlier price, seals the deal handsomely for Audi in this test of the better double-sport utility vehicle.